You will quickly find that the theme of this post is “waste not, want not”. It was a busy Saturday in the Tryon household. 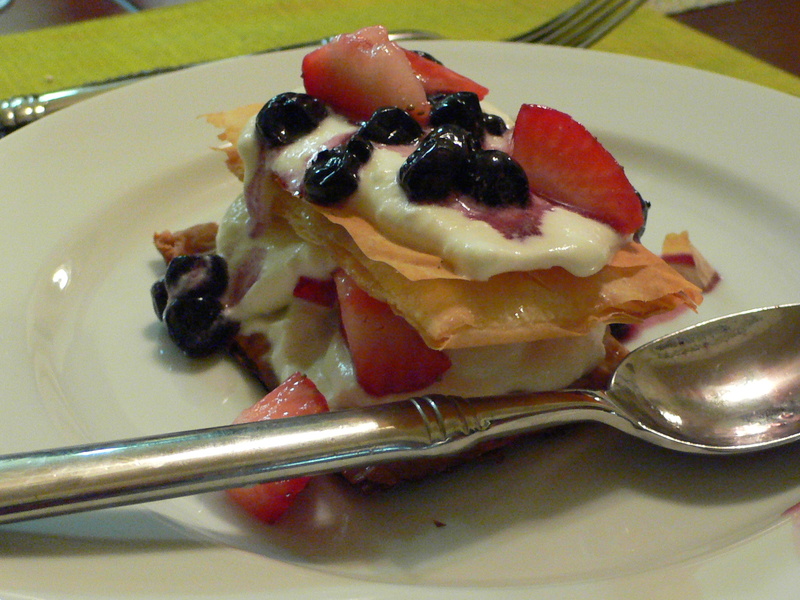 I was busy making whole wheat berry-lemon napoleons (that turned out great, by the way – see below! ), when I had about 7 layers of phyllo dough left over. I just HATE letting good (and expensive) ingredients go to waste. So I put on my thinking cap, and go to it. 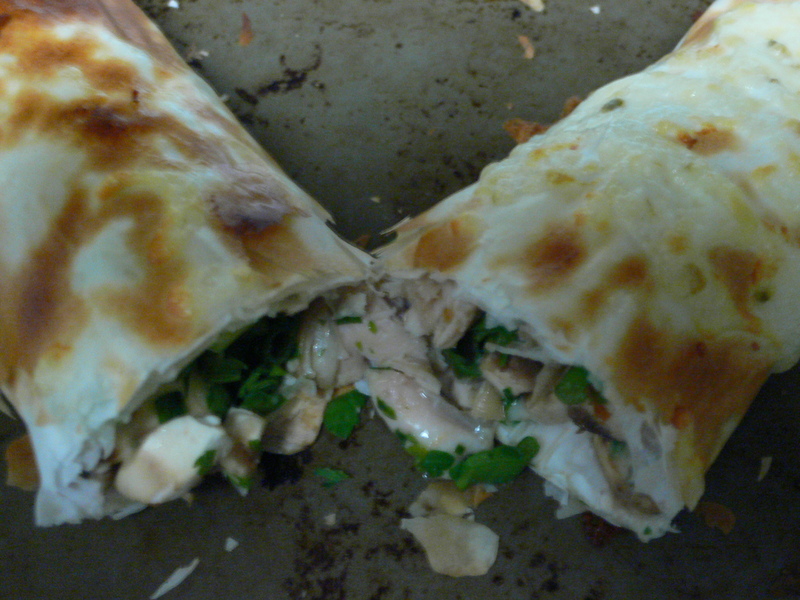 The resulting creating was a delicious, crispy yet light chicken and veggie burrito. I spread out my 7 layers of phyllo (still stacked). Next I took the left-over chicken from the previous night’s dinner and cut it into 1″ pieces and lay it length-wise along the midline of the phyllo. Then, thanks to the creativity of the huz, I added chopped green onions, mushrooms, and the left-over parsley from the week’s cooking class. Finally, a bit of pepper jack cheese and it was time to roll it up. I rolled so that it was like a long burrito and then lightly (and I do mean lightly) basted it with melted butter. To finish it off I dusted Matt’s end with some more pepper jack and placed it mid-over to bake for 6 minutes at 350. 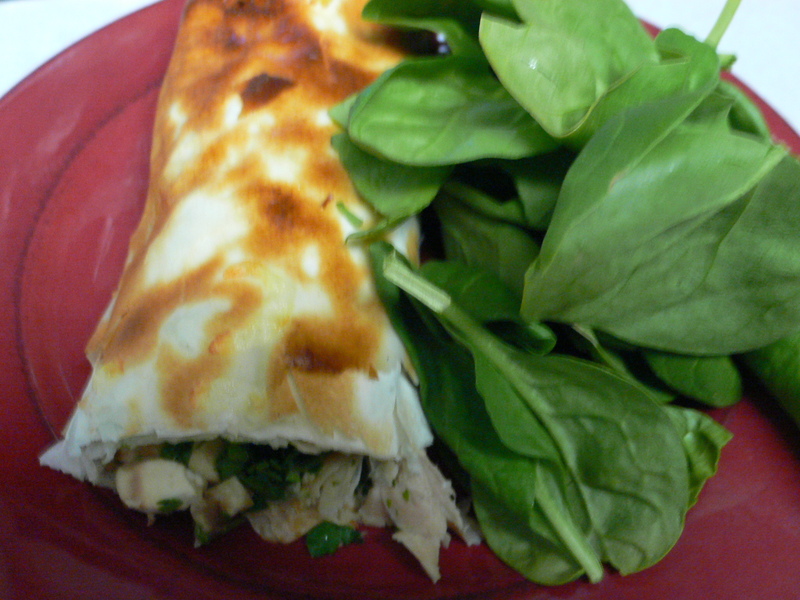 The secret to the success of this burrito was the 4 minutes of broiling to complete the masterpiece. So, in less than 15 minutes I had a hot lunch, with some fiber, green veggies, healthy chicken protein and a splash of flavor with the cheese. Phyllo dough is very light relative to bread, thus overall grains and carbohydrate calories in 7 layers (split in 2, as I did share with the hubby! ), is very little, yet the whole meal felt filling and satisfying. Not to mention the internal satisfaction I get from being resourceful. I purchased a phyllo dough 2-pack for about $4.00 and this provided me enough phyllo for two sets of the Napoleons for social events (pic below, I PROMISE) and the burrito….and a bit for tasting, of course! customize: half with cheese, half without! And the picture you’ve really been waiting for…. Next Article okay, okay, the Napoleon recipe is here too!